I’m so excited to introduce our first guest of the new Pretty in Pink series- the extraordinary Kelly LaPlante. Kelly is an amazing Austin based designer, by way of LA and SF, and pens the wonderful Austin By Design blog. She is also a mom, and in her spare time, organized this year’s inaugural DIFFA Austin Picnic by Design. (Yeah, in her spare time). She is also a partner in the amazing new eatery- Odelay coming to North Austin next year. She is truly an effervescent, bubbly person, with such a pioneering spirit, and I’m lucky to call her a friend. 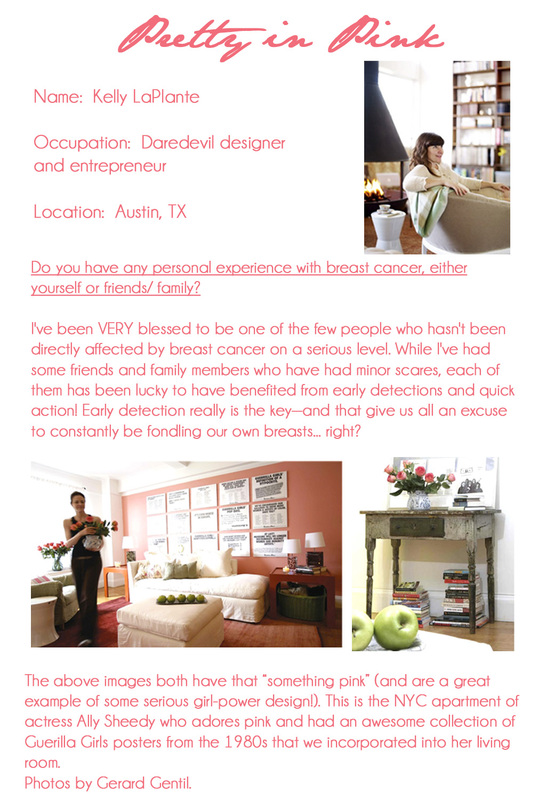 I’ve asked each guest to please share their experiences with breast cancer, either personally or as a supporter. I’ve also asked them to share a space either in their home, or a completed project which incorporates some pink. Please check out Kelly’s blog and portfolio for inspiration and general delight.